In March 2013, the Mayor of London launched his vision for cycling in London. A major element of the vision is the proposed Central London Cycle Grid – a network of cycle routes through Central London and the City, making it more attractive for people who don’t cycle and safer for the increasing numbers who do. Encouraging more people to cycle is a key objective for Camden Council, the benefits are widespread and include: helping to reduce traffic congestion, improving air quality and improving the health of our residents. In 2015, Camden Council started to build a new north-south walking and cycling route along Pancras Road linking Kentish Town to Kings Cross via Royal College Street. Camden Council, through a separate consultation is currently consulting on changes to Midland Road which links Pancras Road to Kings Cross, including the junction of Midland Road with Euston Road For more information or to respond please visit consultations.wearecamden.org/culture-environment/midland To the south of Euston Road, Transport for London (TfL), Islington and Camden Councils are also jointly asking for local people’s views on extending the North-South Cycle Superhighway from Farringdon Station to King’s Cross. For more information, or to respond to the North-South Cycle Superhighway please visit consultations.tfl.gov.uk/cycling/northsouth Should all of these projects be approved then there will effectively be a key cycling route from Kentish Town Road to Farringdon Road and beyond to Elephant and Castle, the latter under construction by TfL. 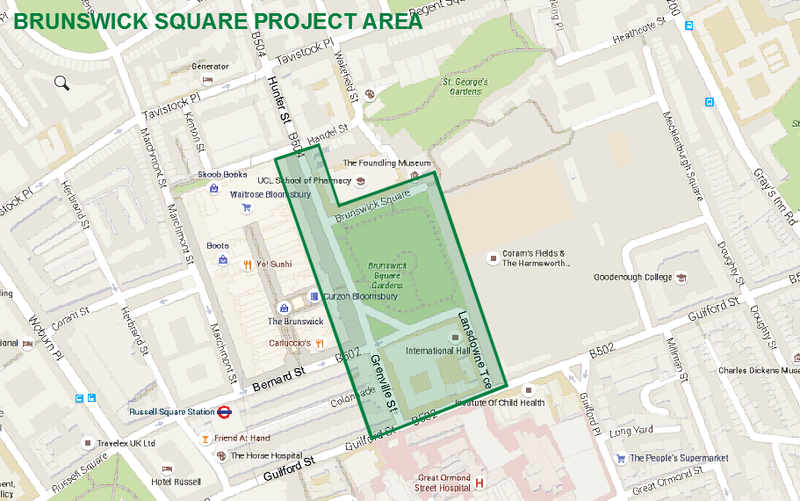 To capitalise on proposals from nearby schemes the Council has identified Brunswick Square as an important intersection of east-west and north-south cycle movements and would like to make some improvements that would link to those made between Kentish Town and Kings Cross and would help to provide a continuous walking and cycling route southwards to Bloomsbury. The proposals aim to deliver the key objectives of the Central London Cycle Grid and improve public spaces in an area of high footfall and historical significance. 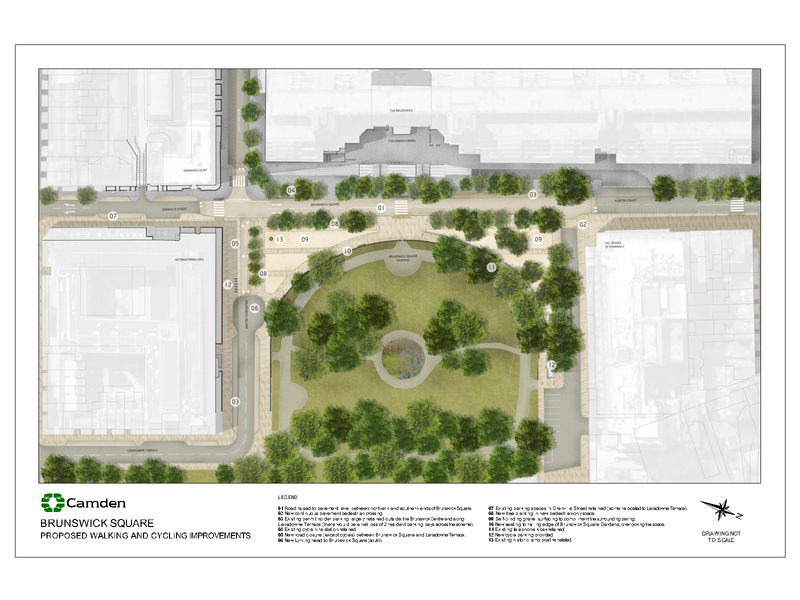 This page and the drawing below provide details about proposals for Brunswick Square between Handel Street and Guilford Street and includes improvements on; Hunter Street, Brunswick Square, Bernard Street, Grenville Street and Lansdowne Terrace. In the 3-year period ending June 2015, 5 slight traffic collisions occurred within the project area; 3 involving cyclists, 1 pedestrian and 1 powered-two-wheeler (motorcycle). There were no serious casualties or fatalities within that timeframe. Although the number and severity of collisions is relatively low, road safety is a key consideration. By reducing road widths; simplifying junctions by limiting the number of permitted movements; raising areas to pavement level; improving pedestrian crossings; and helping to make cyclists more visible, it is likely there will be reductions in speeds and collisions which are complemented by better public spaces. Public realm improvements to the corner of Brunswick Square (west) where it joins Bernard Street and Grenville Street, providing a large pedestrian-only space with new trees, seating and better lighting. This is only possible by closing Lansdowne Terrace where it meets Brunswick Square. Access to Lansdowne Terrace from Hunter Street or Bernard Street would be closed to motor traffic (except cyclists). Southbound motor traffic would continue to Guilford Street via Grenville Street. Northbound motor traffic would no longer be able to access Hunter Street and beyond toward Euston Road from Guilford Street (access would be retained via alternative routes). 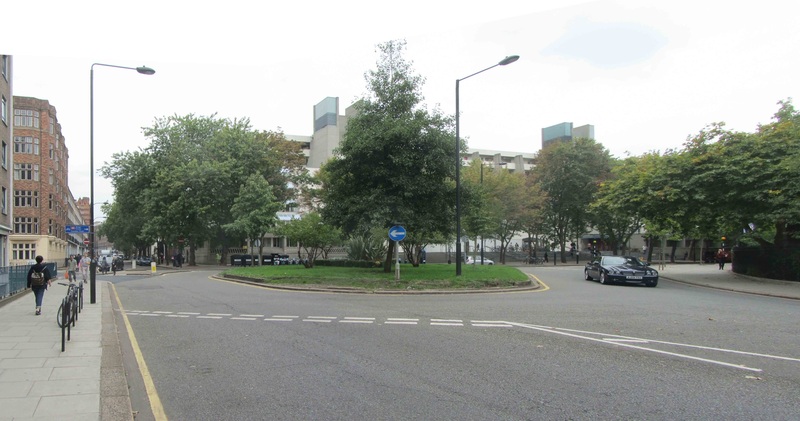 Access from Bernard Street to both Guilford Street and Brunswick Square (northbound towards Hunter Street) would be retained. Road raised to pavement level on Brunswick Square between the junctions of Hunter Street with Brunswick Square and Grenville Street with Bernard Street. Existing zebra crossings improved. New zebra crossings provided on Grenville Street and Bernard Street near the junctions with Brunswick Square. Pavements widened on Brunswick Square, Lansdowne Terrace, Bernard Street and Grenville Street to optimise space allocated to pedestrians and cyclists. New cycle track between Brunswick Square (west) and Lansdowne Terrace. Inset parking bays to accommodate majority of existing parking provision. There would be a net loss of two residents’ permit parking bays throughout the project area. Below are before and after visualisations of what Brunswick Square could look like if there were broad support for the scheme. While it will not be possible to reply to you individually, all comments will be taken into account. The Cabinet Member for Regeneration, Transport and Planning will make a decision in June 2016 on whether or not to proceed with the scheme and you will be informed via the council’s website of the outcome of this consultation within three months, where possible. Under the Local Government (Access to Information) Act 1985, we may not treat your response confidentially, as it will be available for public inspection. Please only write to us about the consultation issue. If you want to comment on any other matter, please use a separate letter.